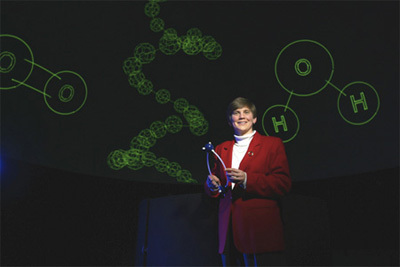 In 2001, Dr. Linda Schadler was looking for new ways to get elementary school students interested in atoms and molecules, as part of a new NSF-funded nanotechnology center, when she had the idea to use a planetarium to explore the nanoscale world. “If you can go to the stars, why can’t you go down to the molecular level?” Schadler asked. In 2002, they produced a seven-minute pilot show for the local planetarium called “Molecularium”. Despite its simple vector graphics, the show was very popular at the museum. 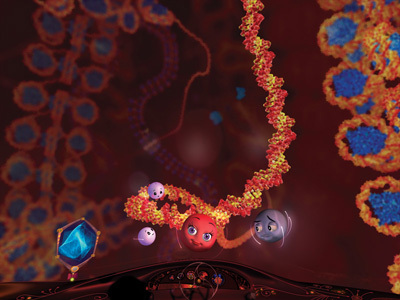 It proved that atoms and molecules could be captivating to kids. Assessment data showed that audiences were learning a lot. “It was clear that it worked even in a very crude format,” says Dr. Richard W. Siegel, the director of the nanotechnology center. The scientists knew they were on the right track, but the basic show was not what Schadler envisioned. “We needed full color Hollywood-style animation.” The team was determined to take their idea to the next level. 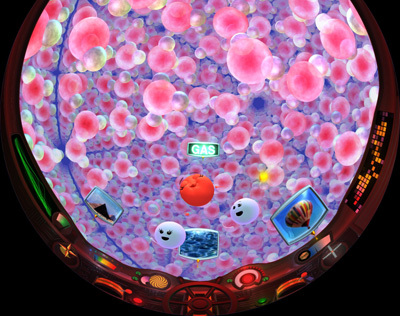 In early 2004, Schadler, Garde, and Siegel were awarded a U.S. National Science Foundation grant to make a new Molecularium show for digital domes. They brought in the filmmaker and experience designer V Owen Bush to bring the idea to life. Bush founded the production company Nanotoon Entertainment to realize the new project. He enlisted his friend, writer and inventor Kurt Przybilla, to help develop the show as a character driven story. They proposed a thrilling adventure of atoms flying a ship called the Molecularium through nanoscale worlds. The scientists loved the idea and collaborated with them on the development of the script. 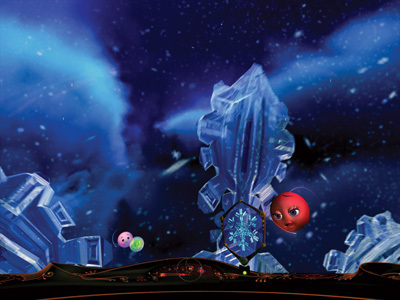 With Bush directing and Przybilla producing, they recruited and assembled a small team of creative and technical professionals to produce Molecularium – Riding Snowflakes, a digital dome adventure. Chris Harvey, creative director of AMNH’s SonicVision, signed on as art director. Blake Holland and Joshua Minges, core members of special effects legend Douglas Trumbull’s team at IMAX Ridefilm, signed on as technical directors to meet the challenges of bringing this unseen world to the screen and Steve Rein, a professional computer animator for over twenty years, signed on as lead character animator to bring the atoms to life. In February 2005, the team debuted the 23-minute experience. The show created a sensation in the digital-dome planetarium community for its entertaining story, technological innovations, and unprecedented repurposing of the planetarium. 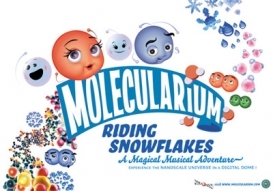 Riding Snowflakes has garnered awards and accolades around the globe, and continues to thrill young audiences worldwide in several languages, including Arabic, Korean and Turkish. “If you are doing something that makes a positive impact, it drives you to keep pushing that idea further to reach broader audiences,” says Siegel, a world-renowned nanotechnology pioneer. He was amazed at the transformation that one screening of Molecularium had upon his young granddaughter. After viewing the film, she seemed to be looking for atoms and molecules everywhere, and seeing the world around her with new eyes. 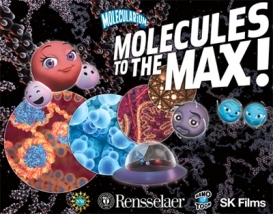 With the success of Riding Snowflakes in digital planetariums, the team quickly set their sights on creating a longer, much more ambitious large-format film sequel, Molecules to the MAX! for Imax® and Giant Screen Theaters. Curtis R. Priem, co-founder of Nvidia Corporation, saw the original digital dome show and was inspired. “The Molecularium Project is a perfect example of how highly technical information can be communicated in a simple, accessible form that even children can understand.” He threw his support behind the project with a generous gift to make the giant screen Molecularium film a reality. The opportunity to make a giant-screen 3D film was an exciting, but daunting challenge. “Everything, from the simulations to the story and animation, had to be bigger, better and much more complex for the largest film format in the world,” says Przybilla. The team knew from the outset that it was a massive undertaking and production began in 2006 with a much larger team, now a grassroots animation studio. In the recruiting process, Bush and Przybilla scoured the web for highly skilled professionals who would be available and willing to relocate to Troy, New York, where Rensselaer is located and work in a supervisory relationship, mentoring the small team of highly motivated novices and student interns. Eventually Nanotoon had as many as 10 guests visiting Troy to work on the project from locations as far-flung as Canada, California, and Alabama. When Nanotoon was not able to recruit artists with the specialized skill-sets they needed, they would work remotely with the best in the business, using video-conferencing and other networked collaboration tools. The production pipeline for Molecules to the MAX! emulated the process of an Hollywood animation studio. A typical shot would go through a series of departments- from concept art to storyboards, to blocking, to animation, to lighting and shading, to compositing, to high resolution rendering , and eventually to 3D render. By the end of the production, the team had a render farm at Rensselaer with over 400 processors and over 60 TB of storage. But even this was not enough to complete the job in time. Fortunately, Rensselaer Polytechnic Institute is also home to the Computational Center for Nanotechnology Innovations, one of the largest supercomputers in the world, and the Molecularium team was given access to even more processors to get the job done. In 2009, Molecules to the MAX! was completed and premiered to the Giant Screen Cinema Association. In 2010, the 3D version of the film premiered. Since then, it has been translated into Spanish, Chinese, Japanese, and Arabic and shown in large format and IMAX theaters around the world. Once Molecules to the MAX! was successfully in distribution, the Molecularium Project team chose to focus on the small screen for their next effort. The goal of spreading science literacy and reaching as many people as possible made a web-based production a natural next step. 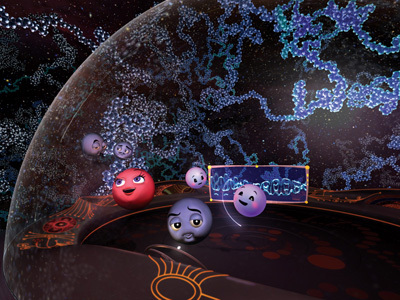 They wanted to create a place full of interactive games, activities and animations that would teach kids of all ages about the nanoscale world of atoms and molecules. They came up with the idea of making NanoSpace, a virtual theme park for the Molecularium cartooniverse that would be a fun place that kids could go to learn through active participation, exploration and play. A small team of artists, animators and web developers was assembled to design, develop and build the park and all its attractions. In the end, NanoSpace would have over thirty games and activities, as well as five new animations when it launched in 2012. After the successful launch of NanoSpace online, the Molecularium team recognized the ever-increasing popularity of gaming on mobile devices and decided to focus their energies on developing a game application. 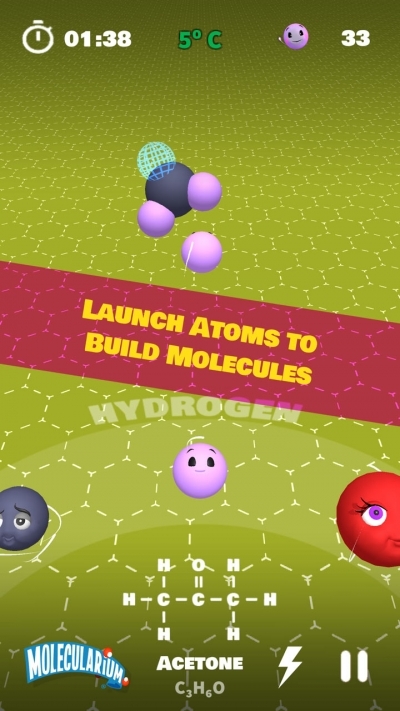 Based on the popularity of the Build’em game in NanoSpace, they began to develop a molecule building game designed especially for touchscreen devices. In late 2017, they launched My Molecularium – The Molecule Building Game for both iOS and Android devices. The object of the game is to launch atoms to build molecules of increasing complexity using the chemical and structural formulas. Utilizing the internal gyroscopes found in most smartphones, players aim their shots by moving their devices. My Molecularium’s popularity has steadily increased since it’s launch. It has received numerous awards including an Editor’s Choice Award for Excellence in Design by the Children’s Technology Review and a recommendation from the Parents Choice Foundation.